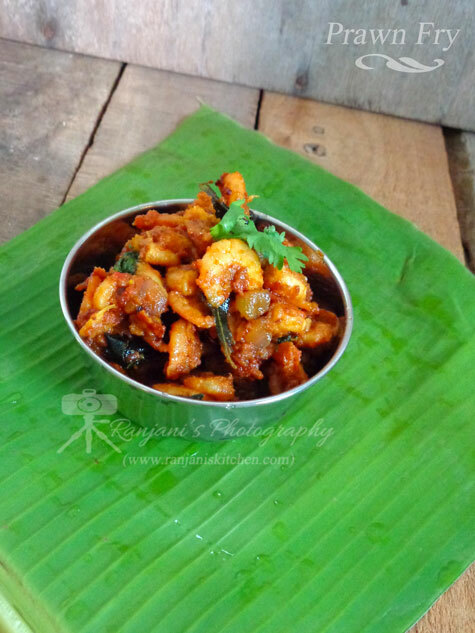 Prawn fry, this version is simple yet tasty. This is not a stir prawn fry. 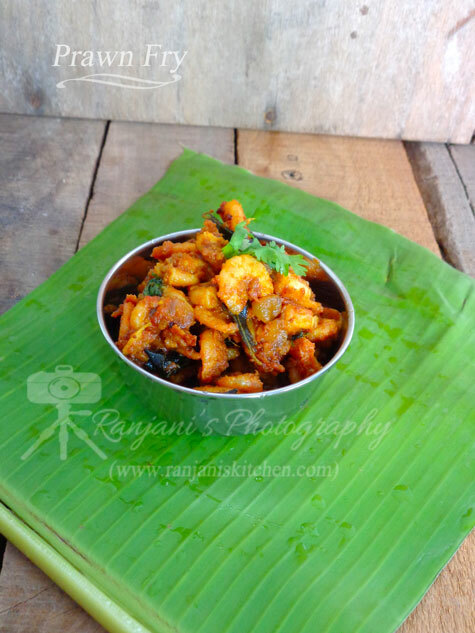 Its kind of thokku consistency dish goes well with biryani, side dish for rice, even its good for the accompaniment of rasam,sambar and curd rice. Wash prawns, remove the shells, again wash for two to three times to remove sands if any, completely drain the water and keep aside. Heat a kadai, add oil, once it get heated, add finely crushed fennel seeds. Fine aroma will come from the seeds, now add curry leaves and shallots (Vengayam), sauté for a minute till the onion turns translucent. Add crushed garlic to it, stir till the raw smell of garlic goes off. Then add chopped tomatoes and sprinkle the salt over it. Cook in medium flame till the tomatoes turn mushy. Now add the spice powders, Red chili powder, coriander powder, cumin powder and Garam masala powder. Mix well all the spices to blend well with the masala. Make sure to cook in medium or low flame to avoid burning and sticking at the bottom. Add Washed prawns to this mixture and stir well without adding water. Keep the flame medium and stir occasionally to cook the prawns equally on all sides. Prawns leave some water so need to add water. Keep stirring and add some oil to cook well. Cook covered with a lid for 3 to 4 mins. Then again add little oil and toss well. Add chopped coriander leaves, mix well and turn off the flame. Serve hot with rice as side dish. 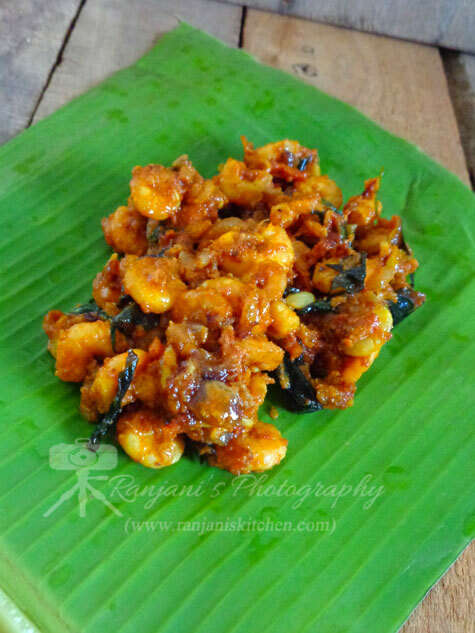 Shallots are good to taste than big onions for this prawn fry. I used refined oil. But sesame(gingelly) oil will tastes good. Do not add water as it will make prawns stiffer. The water comes from prawns and oil we add is enough to cook. Add extra oil if needed. 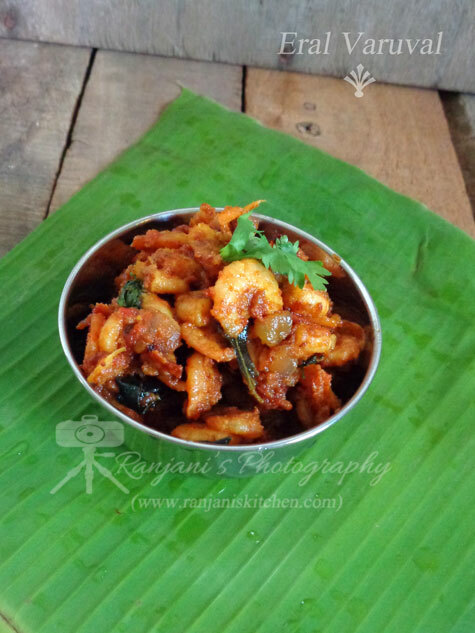 I am Sivaranjani Rajendran(Ranjani), an author behind Ranjanis Kitchen. I like prawns in any form and very impressive click too.Thanks for your lovely comments .